Please park in the National Trust car park as marked on the map. Take the A40 from Abergavenny or Crickhowell, turn onto the minor road signposted to the vineyard (NP7 7LA). After the vineyard continue up the hill, around the hairpin bend, take the right fork past the house for approximately ½ mile. NB The Sugar loaf is a very popular tourist spot so the narrow road can be busy; please show consideration to other users. Ideally this should be done before you fly, but if this is not possible please book before the end of the following day. Your membership fee covers the flying cost but we need to be able to show a log of site usage. Take-off is actually from near the car park of Mynydd Llanwenarth which is a foothill of the Sugar Loaf. Access to take-off is by foot only. Park at the official National trust car park, walk east 250m along road to the unofficial parking spot, then walk up hill 50m. A 25m wide strip of bracken is cut late summer which makes take off easier for paragliders. When the bracken is at its highest, use one of the grass tracks which run parallel to the road. Take-off is very shallow, very often with a line of cars parked where the slope then flattens out (so don’t park here but use the National Trust car park). This is a technical, alpine style, take-off. It is only suitable for experienced pilots. Take-off is in the lee of the trees in front and you can expect significant sinking air (and/or turbulence) before you clear the tree line in front. Top landing is possible to the NE of take-off (A). Bottom Landing (B) is small and technical. It is bordered to the north and south by trees, west by the farm house, and east by power lines. It is only suitable for light, or nil, wind days. South East Wales sites often have very large, undefined take off and top landing areas, which may change position according to conditions. To avoid the potential for collision, pilots making a top landing should keep well away from gliders taking off, who may in some cases have limited visibility. This is essentially a nil/light wind thermal site. Dynamic ridge soaring is unlikely as a strong enough breeze is likely to be very turbulent, but it can be possible to use the anabatic flow to soar the slope on warm afternoons and evenings. For paragliders it is advised that the site is only flown in a LIGHT SSW. If the wind is coming from the direction of the Blorenge it is very difficult to gauge genuine wind speed and you may encounter severe turbulence. The site is in the lee of the Blorenge and so liable to extreme turbulence in anything above 15mph. SSE & S, can be turbulent on take-off. SW can give severe sink at the spot where the cars are usually parked. There are tall trees and a wall below the road which are not visible from take-off. There are power lines running parallel to the ridge near to the A40. The area is owned by the National Trust and disturbance must be minimised. A maximum of 6 fully rigged hang gliders is permitted at any one time. Flying is not permitted on Bank Holiday Weekends. 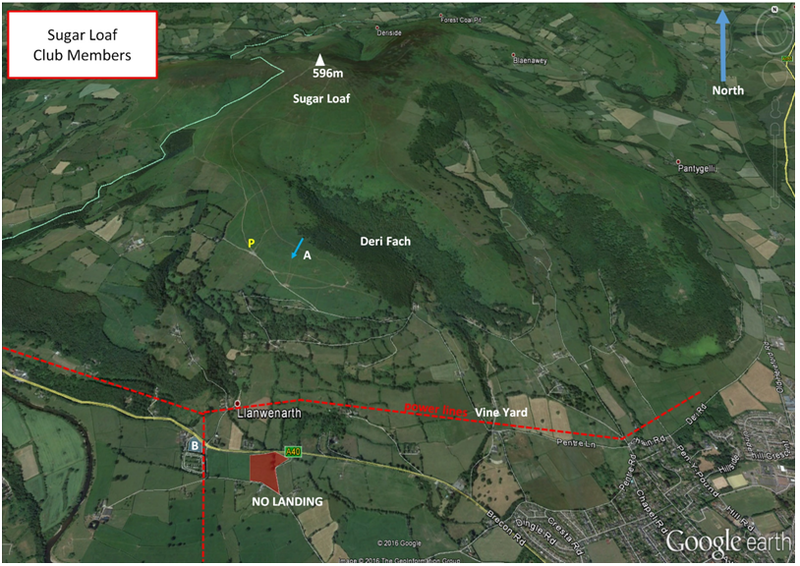 It is a condition of the agreement in place with National Trust that prior to flying you log onto web collect and log your use of the Sugar Loaf site. The Sugar Loaf Mountain itself (the cone shaped peak to the south of take-off) is not part of this site. SEW Members Only Site. You must have in date membership subscription to SEWHGPGC. SEW helmet sticker to be stuck on your helmet at all times. PG – Simon Green flew 91.5km from the Sugar Loaf on 4th May 2016 on his Triple Severn King Glider. He Landed at Swancote. All rights belong to Google Inc. SEWHGPGC is a nonprofit making organisation. If you require further advice about a particular SEWHGPGC site please contact a Club Coach. Please report all accidents to The Club Safety & Training Officer Steve Millson and the BHPA. Please visit the BHPA for the most current Incident Report Form. This document is a guide only. We advise that anyone Hang Gliding and Paragliding conduct a dynamic risk assessment prior to flying any site. This should be continuously re-assessed due to the changeable conditions of the outdoor environment. Paragliding and Hang Gliding are dangerous sports that can cause serious injury including bodily harm, paralysis and death. Flying SEW sites is undertaken with the full knowledge that Paragliding and Hang Gliding involves such risks. As the pilot you take exclusive responsibility for all risks associated with your part taking in the sport. Any liability claims towards the club are excluded. If you are not sure. DO NOT FLY. Dial 999/112 and ask for the Police and then Mountain Rescue. If you are away from the road side then dial 999/112 and ask for the Police and then Mountain Rescue explaining your circumstances. If you cannot make voice calls, you can now contact the 999 Emergency Services by SMS. NB you must register this prior to an emergency. Your name and mobile number. Sugar Loaf Mountain Car Park 3.7km WNW of Abergavenny town.